Multiple secondary osseous foci that appear within 5 months after the diagnosis of symptomatic, radiographically dominant tumor are classified as synchronously appearing multifocal osteosarcoma, so-called osteosarcomatosis (Figure 19-1). 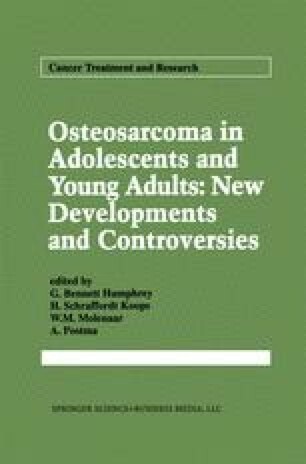 Because of its rapid onset and generally symmetric distribution, several theories have been proposed as to the origin of osteosarcomatosis. Several authors (1–6) have theorized that these multiple skeletal lesions represent multiple primary osteosarcomas of varying sizes and occur from the “multipotent preosseous tissue of the periosteum” . Associated primitive preosseous rests  and humoral and cell-mediated immunity induced by specific neoplastic antigens [8,9] have also been proposed as possible etiologies. However, other authors [9, 10, 11, 12, 13] have suggested that these multiple synchronously appearing bone lesions actually represent rapidly appearing metastases.